Before joining the Law School as a full-time professor in the fall of 1990, Professor Wood was the IRS visiting professor of law and taxation for the 1988-1989 academic year and he spent 10 years with the IRS Office of Chief Counsel. 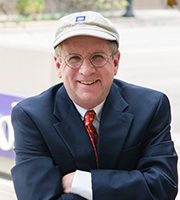 Professor Wood teaches Business Associations and courses in Federal Income Tax. Professor Wood has appeared on the WOSU radio program, Open Line with Fred Andrle, as an expert on federal tax policy. Professor Wood served as chair of the committee that designed the Law School's current building.